Friends of Cozumel sponsors various short-term projects throughout the year to benefit families in need as well as the broader community of Cozumel, including projects related to the environment, health and safety, culture, etc. We invite you to join us as a volunteer and/or donor. Many of these volunteer commitments require only a few hours. We strongly believe in providing opportunities so people learn to help themselves versus creating an ongoing dependence on assistance. Projects support individuals, families and non-profit organizations that demonstrate willingness to help improve their situation; areas within the community we personally know have very limited resources; and special needs identified by local organizational leaders. 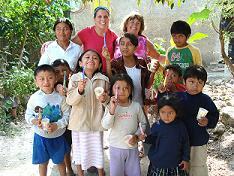 Some projects provide donated goods to families for short-term help through a crisis period (i.e. food) or for a specific resource they could not otherwise afford (i.e. school supplies). Cash is not given to families to ensure donated funds are used for the intended purpose. Many families struggle to provide even basic staples of beans and rice for their children to eat due to lack of work during low tourism seasons (Apr.– Jun. & Sept. – Nov.). Buying, packing and distributing packages of basic food supplies often occurs in the fall. 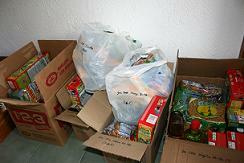 Donations of $20US provide a nice package of food staples for a family. and/or a pair of shoes during clothing distributions. School age children (ages 4-14) need black shoes, tennis shoes, white socks and underwear in early August to begin school. Health and hygiene supplies are “luxuries” to families with limited resources. We distribute these donations with food or clothing or as a part of a special project like the flouride treaments provided to children during the Feb. 2010 MIssion Trip at right: toothbrushes, toothpaste, shampoo, soap, etc. 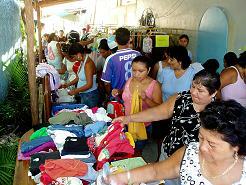 Provide families an opportunity to buy items at affordable prices (honors their pride in being able to pay a few pesos). Donated items are often higher quality than local goods. My husband and I are travelign to Cozumel for a family vacation and we would like to do some volunteer work while there. Either gathering supplies and bringing them to a donation center or volunteering our time and resources, we are interested in some different ways we can give of our time. We will be available in Cozumel from November 22nd-27th. I know its short notice but we would love to help. Also if there is a list of things we can bring with us in order to donate for the Families in Need program or the School Supplies program it would be helpful to have a list! Thanks so much!